Hand-painted, custom-painted, customized, personalized. Heights: 3-3/8". Width: 5.25". Thick: .020. Weight: 0.056oz. Stamped steel. Choose your type, finishes, backings, magnet or ornament. 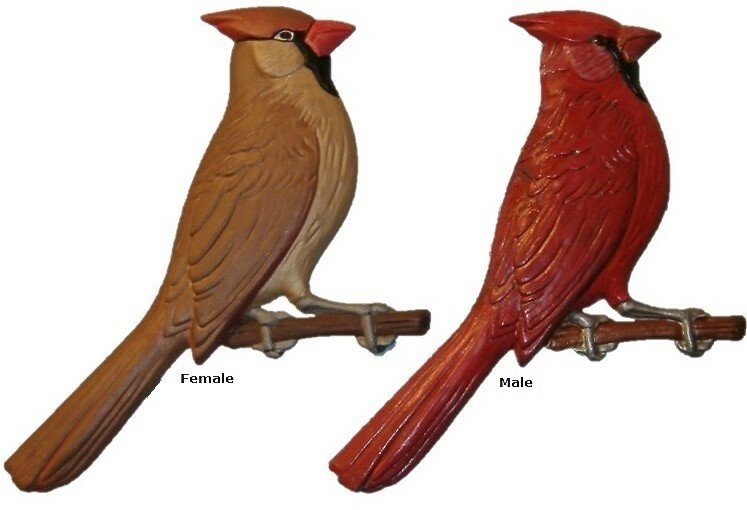 Either the female or male cardinal will make a fine hand-painted gift and decor piece for any bird enthusiast. Made & hand-painted in the USA. Colors shown: Body: Brown variations with touches of black. Beak: Yellow. Legs: Sliver. She's standing on a branch which is painted brown. Colors shown: Body: Red's and black. Beak: Yellow. Legs: Silver. He is standing on a painted brown branch. Choose below type, finishes, backings, magnet or ornament.